NEW YORK -- The New Jersey Devils knew all along that opposing bodies would be in their crosshairs when winding up for shots on New York Rangers goalie Henrik Lundqvist. They weren't disappointed in Game 1 of the Eastern Conference Finals on Monday at Madison Square Garden. "From my view, I saw him [Lundqvist] for about 10 minutes of the game because there were so many Ranger players in front of him," Devils goalie Martin Brodeur said. "But he played pretty well." 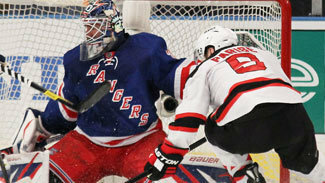 Lundqvist notched the fifth playoff shutout of his career and second this season on 21 saves in a 3-0 victory over the Devils to open a 1-0 lead in this best-of-seven series that resumes Wednesday in Manhattan. Additionally, he was also aided by 26 blocked shots from a team that has averaged 19.5 blocks per game in the playoffs. "It wasn't anything we weren't prepared for, we knew it was coming," Devils captain Zach Parise said. "We just have to do a better job of getting the point shots through and getting it past their first guy." Devils coach Peter DeBoer agreed. "You can't get frustrated by something you expect," DeBoer said. "We know that's what they do. And you've got to find a way around it. We still generated enough offensive opportunities to score some goals." The first period was highlighted by a pair of semi-breakaways, in fact. Parise had the first attempt when he broke into the Rangers end along the right-wing boards before his chance was thwarted by defenseman Ryan McDonagh to Lundqvist' left at the 6:10 mark. The second came off the stick of Ilya Kovalchuk at 10:48 when his locomotive rush up ice and backhand with McDonagh in hot pursuit was denied by Lundqvist of the left shoulder -- one of six saves he made in the opening 20 minutes. The Devils certainly had their chances in the second, too, when they managed 10 shots on Lundqvist. The best opportunity came shorthanded, when Parise managed three quick rips in succession low in the left circle at the 14:43 mark. Lundqvist squeezed the pads and denied the Devils' captain each time. "I saw him coming across and tried to go five-hole the first time," Parise said. "The puck kept coming back to me and he was able to make the saves. He covers the low part of the ice very well and when you get in tight, he challenges and there's not a lot of room, so I was trying to chip one over him after that." Kovalchuk had a golden opportunity just 2:31 into the third, when he ripped an uncontested snap shot from the left circle that Lundqvist turned away. While the loss was discouraging, every player in the locker room was in agreement that they had the better territorial advantage in the opening 40 minutes. "When we put the puck in the zone properly, I thought we did a good job of retrieving it and getting it back and a couple times, we didn't have very good dumps and turned it over," Parise said. "When we do that, it's easy transition for them. When we got it below their defense, we did a good job a getting the puck back." Parise led his team with five shots, but finished with a minus-2 rating in 17:45 of ice time. Kovalchuk earned a team high 23:14 of ice time and took three shots on Lundqvist. "We had some chances, but I think we could forecheck better and get more pucks away from [Lundqvist]," Kovalchuk said. "It's just the first game; we'll have to see what we could do better." Parise felt that after Rangers defenseman Dan Girardi had given his team a 1-0 lead just 53 seconds into the third period, the home team dictated the pace of the game. "We were OK until the third period," Parise said. "We gave up that goal, and we didn't play as well after that. That's something we weren't doing before in the other series." Brodeur played very well in defeat, turning aside 25 shots. He made a splendid diving block with the glove hand off a shot from Marc Staal from low in the left circle with his team trailing, 1-0, midway through the third. "It was desperation really," Brodeur said. "I know Girardi had a similar shot, but I was able to see Staal's. I didn't know if [Staal] had the puck, but I dove and he shot at same time … I got a little lucky." Brodeur feels as though the series if far from over. "We've just got to stay focused and believe in what we're trying to do," he said. "We're playing a different team, defensively, than maybe the Philadelphia Flyers … they're a lot more in our shooting lanes. We have to find ways to expose them a little more. "We've done it in the regular season and, right now, they're hot and blocking pucks. They're paying the price to win and that's what hockey is all about."